During a routine stop at the grocery store, Miles Medina MS ’14 had a random thought. Why couldn’t the store grow the very produce it sells on its roof? That random thought led Medina to explore the world of aquaponics, a journey that has earned him first place for his master’s thesis in “Outstanding Thesis in Food and Agricultural Science Competition” hosted by the U.S. Department of Agriculture-National Institute of Food and Agriculture (USDA-NIFA), American Association of Hispanics for Higher Education (AAHHE), and Texas A&M University-Corpus Christi. “As our global population increases and more of us live in cities, we have to find opportunities and develop new ways to provide for ourselves in a way that’s environmentally sustainable,” Medina said. Medina earned a master’s of science in environmental studies with a certificate in agroecology from the Department of Earth and Environment in the College of Arts & Sciences. Medina’s graduate research was funded by a USDA-NIFA Hispanic-Serving Institution Grant. 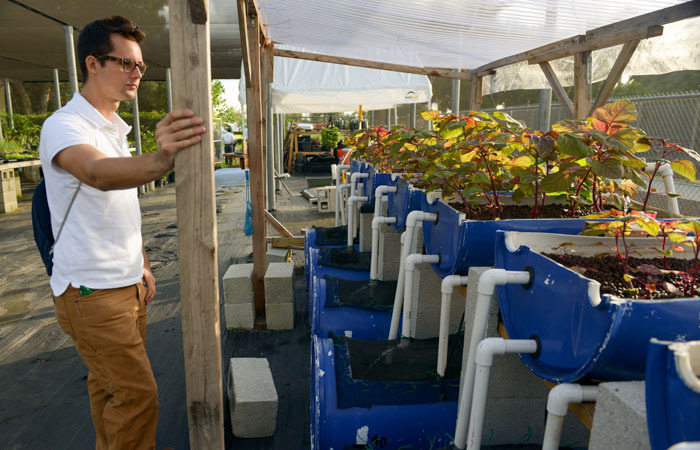 Aquaponics is a very interesting method that definitely deserves recognition. As the population grows alternative gardening techniques are necessary! In some big cities in America and Japan hydroponics is pretty successful already. Thank you for the post! As a gardener I am very interested in all modern gardening solutions!